What is the difference between a child born in the Twenty-first century and one born in 300 BC? Nothing, since human nature is unchanging, but everything, if modern child-rearing techniques are applied. Human nature never changes, be it during ancient times or in the modern world. Thus, Aristotle’s philosophy was as brilliant in 350 BC as it is today. 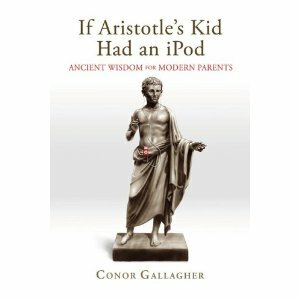 And, according to Conor Gallagher, author of If Aristotle’s Kid Had an iPod: Ancient Wisdom for Modern Parents, Aristotle has a lot to teach today’s parents. Such wise insights as, “You must desire the virtuous life to fully obtain it,” and, “Excellence is an art won by training and habituation. . . . it is not an act but a habit” are as applicable today as they were 2,400 years ago. After earning a law degree and a masters in philosophy Gallagher taught college level classes, became vice president of St. Benedict Press and Tan books, and is the executive producer of Catholic Courses. He also added five more children, making eight of them ages ten and under. Gallagher continued to apply ancient wisdom in his own home with positive results. He believed that other parents could benefit from this philosophy if they had the opportunity to understand it. If Aristotle’s Kid had an iPod, translates concepts from Aristotle’s most famous work, Nicomachean Ethics(the same name as both his father and son) into a language everyone can understand. Born in 384 BC in Greece, Aristotle’s many works are all considered masterpieces. Perhaps the most influential thing Aristotle did during his lifetime, was to tutor Alexander the Great until the age of sixteen, at which time Alexander began to conquer the known world. The greatest emperor had the greatest teacher. Although Gallagher loved philosophy, he understood that many people were put off by it, imagining it was beyond their understanding. “But philosophy is for normal people,” he said. “The problem with philosophy is philosophers. It’s hard to read because of the method in communication, but it is not hard to understand.” He compared it to reading Dr. Seuss in German. He would not be able to read it, yet it’s simple to understand the stories. In order to become virtuous and happy, Aristotle taught that our children must perfect their human nature in a particular way. And that is what Gallagher captures. He explained, “It is a parent’s responsibility to teach their children the purpose of their actions and constantly to remind them that the true destination is happiness with God.” According to Gallagher, such modern social sites as Facebook, and contraptions such as iPads, Xboxes and iPods, have aspects that contradicts Aristotle’s philosophy for instilling good virtues. Thus, Gallagher warns against scientific advancements that distract us from the world rather than engaging us in it. Many parents might balk at such an indictment, but the reasoning is explained in an orderly development of logic so that parents, like the kids, are being nurtured along by Aristotle.